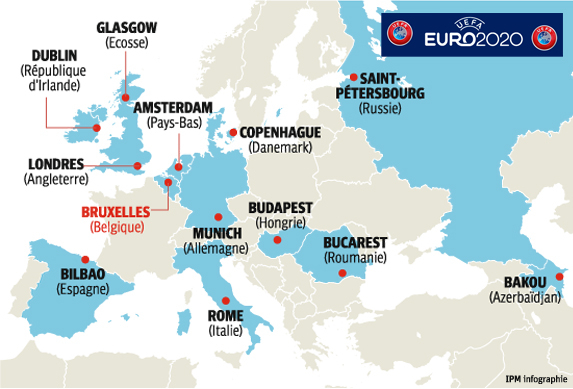 The day before yesterday UEFA unveiled their masterplan to celebrate 60 years of the European Championships and have decided to host the tournament in 13 different destinations throughout Europe. London will host both semi-finals and the final. Good idea or an expensive shambles? I don't. Given that fans in the stadium were long ago dismissed as irrelevant in favour of tickets for UEFA cronies it's no shock. Another nail in the coffin of my interest. Uefa have yet to confirm how the matches will work but there has been talk of grouping venues based on geographic proximity. Who draws a map with the land blue and the sea white? That's cos they are the first target for this sea inversion flooding plan the French have been working up. Plus the French don't speak French. Rover the Top wrote: Plus the French don't speak French. That's what I keep telling them when I'm there. They just give me blank looks though. ...and mutter incoherently, no doubt. Rover the Top wrote: ...and mutter incoherently, no doubt. Could be an expensive shambles.